Tinted lenses are great for outdoor enthusiasts, athletes, and anyone who wants to add a pop of color to their life. In addition to making your environment appear brighter, they reduce glare, improve contrast, and enhance your depth perception. Whether you want a light tint for a more fashion-forward look, or a darker tint to comfortably shield your eyes from the sun, adding a tint to your next pair of Zennis is easy. Standard tints are one solid color from the top to the bottom of the lens. For outdoor use, a darker sunglass tint is best. Zenni offers the following sunglass tints: dark gray, dark amber, and dark green. Our fashion tints have a light tint and can be worn indoors. 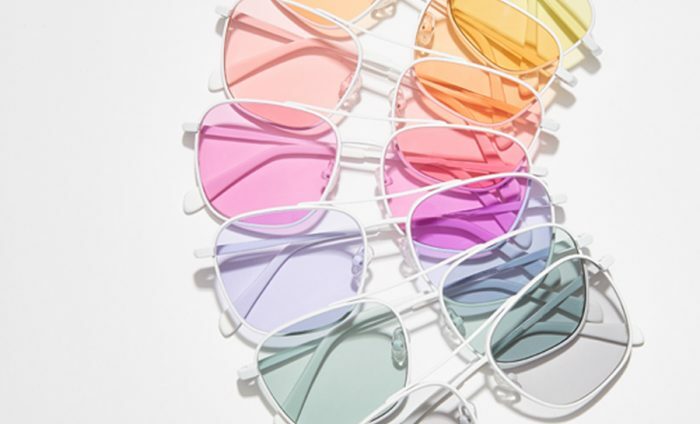 While they don’t offer much shade from the sun, they will add a colorful pop to everyday glasses. 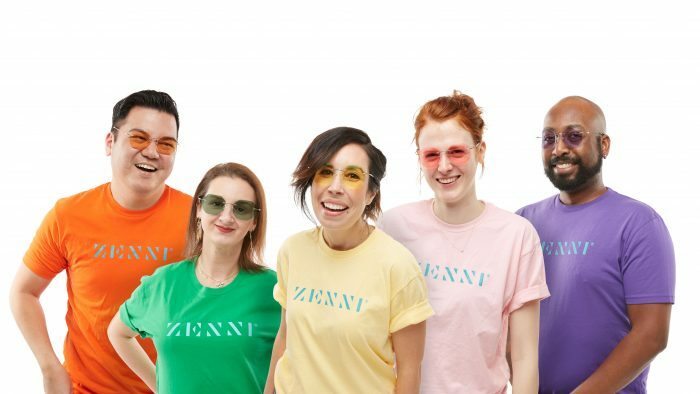 Zenni offers the following fashion tint options: light gray, light green, fuchsia, lavender, orange, rose, and yellow. Gradient tints are darkest at the top of the lens and gradually get lighter towards the bottom. 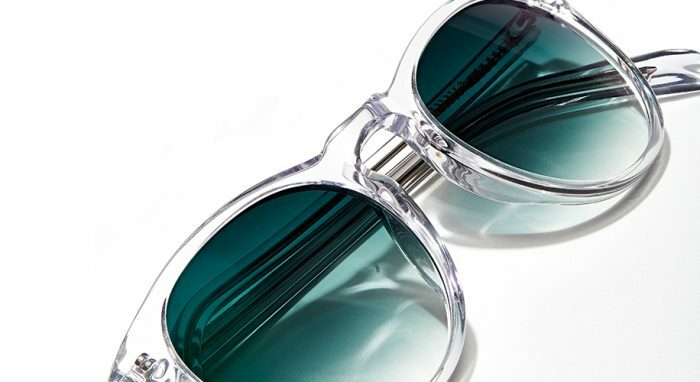 They are a chic choice for outdoor sunglasses. 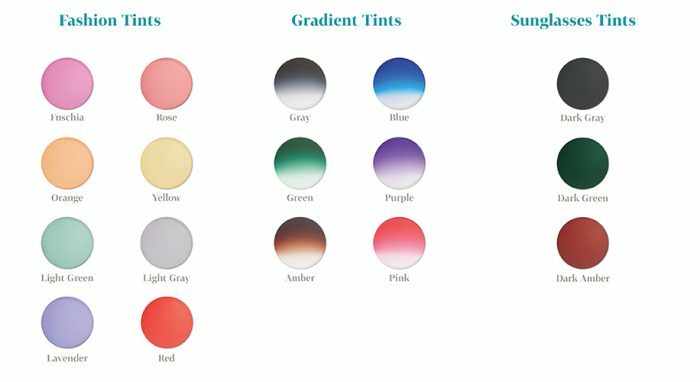 Our gradient tint options include: gray, amber, green, blue, pink, and purple. Gray tints help provide true color perception, as well as reduce fatigue and glare. It is the most popular tint for general purpose use, providing the best sun-blocking and anti-glare protection on bright, sunny days. Amber is a good all- purpose sunglass tint because it enhances contrast. While amber tint can distort the “true color” of the objects you’re seeing, many wearers prefer the warmth it adds to their vision. Pink tints help reduce eyestrain, improve depth perception and road visibility, and aid in contrast adjustment. They are great to wear for sports that involve speed, such as biking or racing, and for situations where you need to be sure of your footing, such as running, hiking, or rock climbing. Green tints are great for low-light conditions since they help to diminish glare, brighten shadows, and are known to help improve visual sharpness. They are great to wear for baseball, golfing, and fishing. Yellow-tinted glasses provide additional sharpness and contrast to your field of vision in outdoor or indoor environments. Yellow-tinted glasses are a great choice when skiing, doing target practice, and even playing video computer games. Purple tints balance color perception and provide contrast against green backgrounds. They provide natural color perception, while shading the eye, making them a great choice for golfers. Orange tints enhance contrast and depth perception, making them helpful for overcast, hazy, and foggy conditions. Common users of orange tints include baseball players, golfers, hunters, and cyclists, as well as those playing indoor sports and water sports. 1. Select Your Frames. Tinted lenses can be added to any Zenni frame. Pick out the frames that you would like to purchase and add them to your cart. 2. Enter Your Prescription Information. You will be prompted to enter your up-to-date prescription information, as well as your pupillary distance (PD). Consult your eye doctor for these measurements, or check out our measuring PD infographic to measure your PD at home. 3. Choose Your Lens Index. A lens index will automatically be suggested based on your prescription. For more information about lens index options check out our affordable lens buying guide. Note that 1.53 Trivex, 1.59 Polycarbonate, and 1.74 High-Index lenses cannot be tinted. 4. Tint Your Lenses. 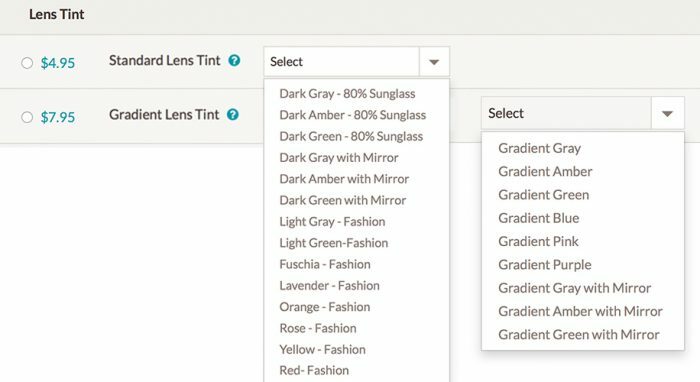 Choose a standard or gradient tint, then select the color from the drop-down list. We also offer a variety of mirror finishes to add to your tinted lenses. 5. Complete Your Order. Once your order is complete, we will start preparing your new eyewear and ship it out to you ASAP.